Primary Invitational Games – another first for HHIS! Last week, a group of Y5 and Y6 students represented HHIS for the first time at Green Valley Games in Rayong. The students took part in a variety of activities, showcasing their skills in Athletics, Swimming and Football. The group were also very intrepid, competing in T-ball – a sport they had never played before. It was great to see their skills develop throughout each game. The team showed great encouragement of one another, as well as towards competitors from other schools. Our students did themselves and the school really proud, displaying a positive attitude throughout the Games. 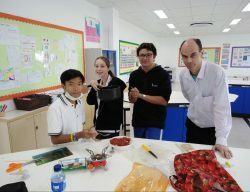 We welcomed the newly appointed Director of Wang Bost School on a visit to our school this week. We have a very positive relationship with our local Thai school and we are all very happy that Director Penpaka would like to continue to work closely with our staff on a mutually beneficial programme of support. Duke of Edinburgh PreparationsStudents have been busy preparing for their term 3 expeditions. This has included map work, kit-lists, setting up tents and also food preparation skills. The training expedition is planned for the 25th and 26th of April, and the students have started planning routes as well organising the resources and equipment they will need. The challenges provided by the D of E award take students right out of their ‘comfort zone’ and the learning is immeasurable. Successful achievements are quite rightly respected by universities and employers but of even more importance, is the personal pride and growth. On Friday 29th March 2019 at 8:40am the Jazz Dance ECA students will be performing the dances they have learnt this term. Parents are very welcome to attend. Our Songkran celebrations will take place on the last day of term, Friday April 5th. Parents are warmly invited to join us at 8:00am for making merit and the traditional water-pouring ceremony. ในวันศุกร์ที่ 29 มีนาคม 2562 โรงเรียนจะจัดประชุม Assembly ในช่วงเช้าบริเวณเวที พร้อมการการแสดง Jazz Dance เริ่มเวลา 8.40 น.